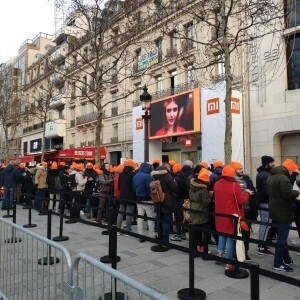 On 18th January, Xiaomi announced via Twitter that it opens the biggest Mi store in Europe on the world famous Champs-Élysées in Paris. A great number of Mi Fans, a name given for Xiaomi’s fans, were lining up outside of the store. Xiaomi opens its biggest European Mi Store in Paris. PHOTO: Credit to Xiaomi. On 18th January, Xiaomi announced via Twitter that it opens the biggest Mi store in Europe on the world famous Champs-Élysées in Paris. In May of 2018, Xiaomi (小米) firstly entered France with its authorized store opened in Paris, located at 39 Boulevard de Sebastopol. In November of 2017, Xiaomi picked Spain as its first market in Western Europe. And it adopts a “new retail” model – a mix of online and offline channels. According to Canalys, a market research company, Xiaomi is the top four smartphone vendor in the first quarter of 2017. Lei Jun (雷军), founder and CEO of Xiaomi, has an ambitious plan to make Xiaomi become the No.1 or 2 smartphone vendor in one or two European countries. And he has chosen to focus primarily on Spain and France smartphone markets. Canalys says that in the third quarter of 2018, Xiaomi’s smartphone shipments to west Europe grew 386 percent year-on-year and ranked fourth in terms of smartphone shipments. Xiaomi’s Q3 report suggests that increasing shipments to the west European also contributes to its increasing average selling price (“ASP”). Prior to officially entering the European market, Xiaomi has entered the Brazil market but quitted within one year. Later Xiaomi entered the India market and won great success there. CNN reports that it broke Samsung’s 6-year dominance in India phone market in 2018 with more than 30% market share. There is also strong growth momentum, as stated in Xiaomi’s Q3 report that it achieved the number one market share position in terms of shipments for four consecutive quarters. It also needs to be noticed that Xiaomi’s international revenue grew 112.7% year-on-year to CNY 22.3 billion and accounting for 43.9% of total revenue in the third quarter of 2018. The European market could be different from the Asian countries that Xiaomi has entered. EqualOcean thinks for Xiaomi to remain its leading market share in Europe, there are several things need to be solved. The first is whether Xiaomi has understood enough about European culture and customers' shopping behaviors in order to design more suitable marketing campaigns and products. The second question is whether Xiaomi is able to solve the patent problem either by genuinely innovating or not to breaching intellectual properties. With the further expansion to the west European, Xiaomi attempts to delivery more diversified and premium products which might increase its brand image and ASP, ultimately boost its revenue. However, the risk factors mentioned above are also needed to be considered.